Muhammad Ali (/ɑːˈliː/; born Cassius Marcellus Clay Jr.; January 17, 1942 – June 3, 2016) was an American professional boxer and activist. He is widely regarded as one of the most significant and celebrated sports figures of the 20th century. From early in his career, Ali was known as an inspiring, controversial, and polarizing figure both inside and outside the ring. 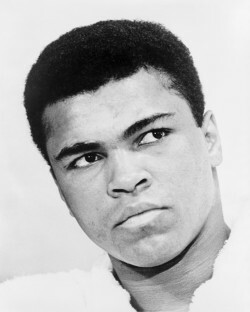 Cassius Marcellus Clay Jr. (/ˈkæʃəs/) was born on January 17, 1942, in Louisville, Kentucky. He had a sister and four brothers. He was named for his father, Cassius Marcellus Clay Sr. (1912–1990), who himself was named in honor of the 19th-century Republican politician and staunch abolitionist, Cassius Marcellus Clay, also from the state of Kentucky. Clay's father's paternal grandparents were John Clay and Sallie Anne Clay; Clay's sister Eva claimed that Sallie was a native of Madagascar. He was a descendant of slaves of the antebellum South, and was predominantly of African descent, with smaller amounts of Irish and English heritage. His father painted billboards and signs, and his mother, Odessa O'Grady Clay (1917–1994), was a domestic helper. Although Cassius Sr. was a Methodist, he allowed Odessa to bring up both Cassius Jr. and his younger brother Rudolph "Rudy" Clay (later renamed Rahman Ali) as Baptists. Cassius Jr. attended Central High School in Louisville. Clay grew up amid racial segregation. His mother recalled one occasion when he was denied a drink of water at a store—"They wouldn't give him one because of his color. That really affected him." He was also affected by the 1955 murder of Emmett Till, which led to young Clay and a friend's taking out their frustration by vandalizing a local railyard. Clay was first directed toward boxing by Louisville police officer and boxing coach Joe E. Martin, who encountered the 12-year-old fuming over a thief's having taken his bicycle. He told the officer he was going to "whup" the thief. The officer told Clay he had better learn how to box first. Initially, Clay did not take up on Martin's offer, but after seeing amateur boxers on a local television boxing program called Tomorrow's Champions, Clay was interested in the prospects of fighting for fame, fortune, and glory. For the last four years of Clay's amateur career he was trained by boxing cutman Chuck Bodak. These early fights were not without trials. Clay was knocked down both by Sonny Banks and Cooper. In the Cooper fight, Clay was floored by a left hook at the end of round four and was saved by the bell, going on to win in the predicted 5th round due to Cooper's severely cut eye. The fight with Doug Jones on March 13, 1963, was Clay's toughest fight during this stretch. The number-two and -three heavyweight contenders respectively, Clay and Jones fought on Jones' home turf at New York's Madison Square Garden. Jones staggered Clay in the first round, and the unanimous decision for Clay was greeted by boos and a rain of debris thrown into the ring (watching on closed-circuit TV, heavyweight champ Sonny Liston quipped that if he fought Clay he might get locked up for murder). The fight was later named "Fight of the Year" by The Ring magazine. While banned from sanctioned bouts, Ali settled a $1 million lawsuit against radio producer Murray Woroner by accepting $10,000 to appear in a privately staged fantasy fight against retired champion Rocky Marciano. In 1969 the boxers were filmed sparring for about 75 one-minute rounds; they acted out several different endings. A computer program purportedly determined the winner, based on data about the fighters. Edited versions of the bout were shown in movie theaters in 1970. In the U.S. version Ali lost in a simulated 13th-round knockout, but in the European version Marciano lost due to cuts, also simulated. 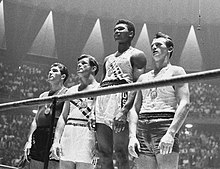 Ali jokingly suggested that prejudice actually determined his defeat in the U.S. version. He was reported to say, "That computer was made in Alabama." In 1971, basketball star Wilt Chamberlain challenged Ali to a fight, and a bout was scheduled for July 26. Although the seven foot two inch tall Chamberlain had formidable physical advantages over Ali—weighing 60pounds more and able to reach 14inches further—Ali was able to intimidate Chamberlain into calling off the bout by taunting him with calls of "Timber!" and "The tree will fall" during a shared interview. These statements of confidence unsettled his taller opponent to the point that he called off the bout. After the loss to Frazier, Ali fought Jerry Quarry, had a second bout with Floyd Patterson and faced Bob Foster in 1972, winning a total of six fights that year. In 1973, Ken Norton broke Ali's jaw while giving him the second loss of his career. After initially considering retirement, Ali won a controversial decision against Norton in their second bout. This led to a rematch with Joe Frazier at Madison Square Garden on January 28, 1974; Fraazier had recently lost his title to George Foreman. On June 26, 1976, Ali participated in an exhibition bout in Tokyo against Japanese professional wrestler and martial artist Antonio Inoki.Though the fight was a publicity stunt, Inoki's kicks caused bruises, two blood clots and an infection in Ali's legs. The match was ultimately declared a draw. After Ali's death, The New York Times declared it his least memorable fight. In hindsight, CBS Sports said the attention the mixed-style bout received "foretold the arrival of standardized MMA years later." Ali was a resident of Cherry Hill, New Jersey, in the early 1970s. At age 32 in 1974, Ali began an illicit extramarital relationship with 16-year-old Wanda Bolton (who subsequently changed her name to Aaisha Ali) with whom he fathered another daughter, Khaliah (born 1974). While still married to Belinda, Ali married Aaisha in an Islamic ceremony that was not legally recognized. According to Khaliah, she and her mother lived at Ali's Deer Lake training camp alongside Belinda and her children. In January 1985 Aaisha sued Ali for unpaid palimony. The case was settled when Ali agreed to set up a $200,000 trust fund for Khaliah. In 2001 Khaliah was quoted as saying she believed her father viewed her as "a mistake". He also had another daughter, Miya, from an extramarital relationship. In 1975, Ali began an affair with Veronica Porché, an actress and model. While Ali was in the Philippines for the "Thrilla in Manila" bout vs. Joe Frazier, Belinda was enraged when she saw Ali on television introducing Veronica to Ferdinand Marcos. She flew out to Manila to confront Ali and scratched his face when they argued. Belinda later said that her marriage to Ali was a "rollercoaster ride – it had its ups and its downs but it was fun". 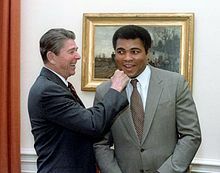 Referring to his infidelities, she said: "Tiger Woods and Arnold Schwarzenegger didn't have nothing on Muhammad Ali". She believed he had "many more" illegitimate children. Ali's daughter Laila was a professional boxer from 1999 until 2007, despite her father's 1978 comments against female boxing: "Women are not made to be hit in the breast, and face like that... the body's not made to be punched right here [patting his chest]. Get hit in the breast... hard... and all that." Ali said that he first heard of the Nation of Islam when he was fighting in the Golden Gloves tournament in Chicago in 1959, and attended his first Nation of Islam meeting in 1961. He continued to attend meetings, although keeping his involvement hidden from the public. 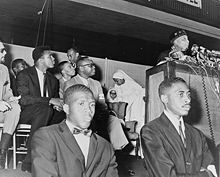 In 1962, Clay met Malcolm X, who soon became his spiritual and political mentor.By the time of the first Liston fight, Nation of Islam members, including Malcolm X, were visible in his entourage. 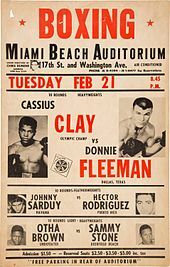 This led to a story in The Miami Herald just before the fight disclosing that Clay had joined the Nation of Islam, which nearly caused the bout to be canceled. After the September 11 attacks in 2001, he stated that "Islam is a religion of peace" and "does not promote terrorism or killing people", and that he was "angry that the world sees a certain group of Islam followers who caused this destruction, but they are not real Muslims. They are racist fanatics who call themselves Muslims". In December 2015, he stated that "True Muslims know that the ruthless violence of so-called Islamic jihadists goes against the very tenets of our religion", that "We as Muslims have to stand up to those who use Islam to advance their own personal agenda", and that "political leaders should use their position to bring understanding about the religion of Islam, and clarify that these misguided murderers have perverted people's views on what Islam really is." 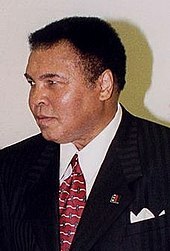 In later life, Ali developed an interest in Sufism, which he referenced in his autobiography, The Soul of a Butterfly. Around 2005, Ali converted to Sufi Islam and announced that out of all Islamic sects, he felt most strongly inclined towards Sufism. According to Ali's daughter, Hana Yasmeen Ali, who co-authored The Soul of a Butterfly with him, Ali was attracted to Sufism after reading the books of Inayat Khan which contain Sufi teachings. At the trial on June 20, 1967, the jury found Ali guilty after only 21minutes of deliberation. After a Court of Appeals upheld the conviction, the case was reviewed by the U.S. Supreme Court in 1971. 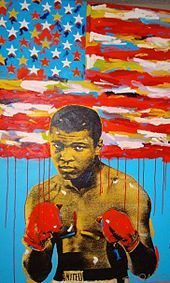 On June 28, 1971, the Supreme Court of the United States in Clay v. United States overturned Ali's conviction by a unanimous 8–0 decision (Justice Thurgood Marshall recused himself, as he had been the U.S. Solicitor General at the time of Ali's conviction). The decision was not based on, nor did it address, the merits of Ali's claims per se; rather, the Court held that since the appeal board gave no reason for the denial of a conscientious objector exemption to Ali, and that it was therefore impossible to determine which of the three basic tests for conscientious objector status offered in the Justice Department's brief that the appeal board relied on, Ali's conviction must be reversed. Recalling Ali's anti-war position, Kareem Abdul-Jabbar said: "I remember the teachers at my high school didn't like Ali because he was so anti-establishment and he kind of thumbed his nose at authority and got away with it. The fact that he was proud to be a black man and that he had so much talent... made some people think that he was dangerous. But for those very reasons I enjoyed him." Ali was hospitalized in Scottsdale on June 2, 2016, with a respiratory illness. Though his condition was initially described as "fair", it worsened and he died the following day at age 74 from septic shock. Following Ali's death, he was the number one trending topic on Twitter for over 12 hours and on Facebook was trending topic number one for several days. ESPN played four hours of non-stop commercial-free coverage of Ali. BET played their documentary Muhammad Ali: Made In Miami. News networks such as CNN, BBC, Fox News, and ABC News also covered him extensively. Ali's funeral had been preplanned by himself and others for several years prior to his actual death. The services began in Louisville on June 9, 2016, with an Islamic Janazah prayer service at Freedom Hall on the grounds of the Kentucky Exposition Center. On June 10, 2016, the funeral procession went through the streets of Louisville and ended at Cave Hill Cemetery, where Ali was interred during a private ceremony. His grave is marked with a simple granite marker that bears only his name. A public memorial service for Ali at downtown Louisville's KFC Yum! Center was held in the afternoon of June 10. The pallbearers included Will Smith, Lennox Lewis and Mike Tyson, with honorary pallbearers including George Chuvalo, Larry Holmes and George Foreman. 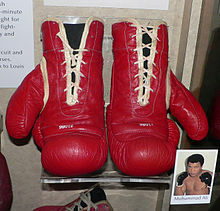 Muhammad Ali's boxing gloves are preserved in the Smithsonian InstitutionNational Museum of American History. Jimmy Jacobs, who co-managed Mike Tyson, used a synchronizer to measure young Ali's punching speed versus Sugar Ray Robinson, a welter/middleweight who was considered pound-for-pound the best fighter in history. Ali was 25% faster than Robinson, even though Ali was 45–50pounds heavier. Ali's punches produced approximately 1,000pounds of force. "No matter what his opponents heard about him, they didn't realize how fast he was until they got in the ring with him", Jacobs said. The effect of Ali's punches was cumulative. Charlie Powell, who fought Ali early in Ali's career and was knocked out in the third round, said: "When he first hit me I said to myself, 'I can take two of these to get one in myself.' But in a little while I found myself getting dizzier and dizzier every time he hit me. He throws punches so easily that you don't realize how much they hurt you until it's too late." Immediately after Thrilla in Manilla, Ali summoned Frazier's son Marvis to his dressing room and apologized for the things he had said about Frazier. 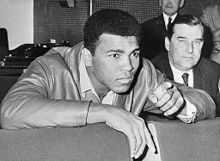 [d] When Marvis conveyed Ali's contrition to him, Frazier commented that Ali should have communicated this to him directly. After returning to the US, Ali called Butch Lewis, and asked for Frazier's private number, saying he wanted to apologize to Frazier. Lewis then conveyed this request to Frazier, but was told not to share it with Ali, according to Lewis. Commenting on Ali lighting the Olympic flame in 1996, Frazier stated that it would have been good if Ali had fallen into the cauldron after lighting the flame, and that he would have pushed Ali in himself if he had the chance to do so. 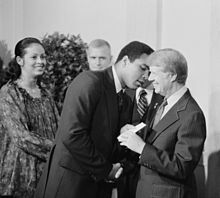 In a press conference held on July 30, 1996, Frazier accused Ali of being a "draft dodger", and a racist;[e]and claimed he would have been a better choice to light the Olympic flame than Ali. Also in 1996, Frazier claimed Ali was suffering from "Joe Frazier-itis" and "left-hook-itis". In 2011, on the eve of the 40th anniversary of his first fight with Ali, and the year of his death, Frazier reiterated that he had forgiven Ali. [g] Frazier's funeral service was attended by Ali who reportedly stood and clapped vigorously when the Rev. Jesse Jackson asked the mourners to stand and bring their hands together one last time for Frazier. On January 8, 2001, Muhammad Ali was presented with the Presidential Citizens Medal by President Bill Clinton. In November 2005, he received the Presidential Medal of Freedom from President George W. Bush, followed by the Otto Hahn Peace Medal in Gold of the UN Association of Germany (DGVN) in Berlin for his work with the civil rights movement and the United Nations (December 17, 2005). On November 19, 2005 (Ali's 19th wedding anniversary), the $60million non-profit Muhammad Ali Center opened in downtown Louisville. In addition to displaying his boxing memorabilia, the center focuses on core themes of peace, social responsibility, respect, and personal growth. On June 5, 2007, he received an honorary doctorate of humanities at Princeton University's 260th graduation ceremony. Ali is regarded by boxing commentators and historians as one of the greatest fighters of all time. Ring Magazine, a prominent boxing magazine, named him number 1 in a 1998 ranking of greatest heavyweights from all eras. In 1999, The Associated Press voted Ali the No. 1 heavyweight of the 20th century. In December 2007, ESPN listed Ali second in its choice of the greatest heavyweights of all time, behind Joe Louis. Ali was named the second greatest pound for pound fighter in boxing history by ESPN, behind only welterweight and middleweight great Sugar Ray Robinson. Ali was an influential figure in the world of hip hop music. As a "rhyming trickster", he was noted for his "funky delivery", "boasts", "comical trash talk", and "endless quotables".According to Rolling Stone, his "freestyle skills" and his "rhymes, flow, and braggadocio" would "one day become typical of old school MCs" like Run–D.M.C. and LL Cool J, and his "outsized ego foreshadowed the vainglorious excesses of Kanye West, while his Afrocentric consciousness and cutting honesty pointed forward to modern bards like Rakim, Nas, Jay-Z, and Kendrick Lamar." 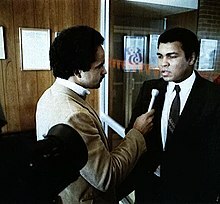 Ali has been cited as an inspiration by rappers such as LL Cool J, Public Enemy's Chuck D, Jay-Z, Eminem, Sean Combs, Slick Rick, Nas and MC Lyte. Ali has been referenced in a number of hip hop songs, including The Sugarhill Gang's "Rapper's Delight", the Fugees' "Ready or Not", EPMD's "You're a Customer" and Will Smith's "Gettin' Jiggy wit It". As a world champion boxer, social activist, and pop culture icon, Ali was the subject of numerous books, films, music, video games, TV shows, and other creative works. Ali appeared on the cover of Sports Illustrated on 37 different occasions, second only to Michael Jordan. [needs update?] He also appeared on the cover of Time Magazine 5 times, the most of any athlete. In 2002, Ali was honored with a star on the Hollywood Walk of Fame for his contributions to the entertainment industry. His star is the only one to be mounted on a vertical surface, out of deference to his request that his name not be walked upon.